Harry Potter author JK Rowling has delighted a small group of her devoted fans by giving her first public reading in Scotland for four years. The world-famous writer appeared before a few hundred people in her home city at the Edinburgh International Book Festival on Sunday morning. The event marked her fifth appearance at the annual literary festival. 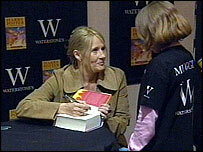 About 500 people had tickets to see the author read from the Order of the Phoenix - the fifth Harry Potter book. She told them her eponymous hero would "survive to book seven" but refused to confirm whether he would grow up to be a wizard. And she revealed that there were two vital questions she had never been asked about the series which might help to unravel its mysteries. The best-selling author jokingly chastised herself for being "shockingly indiscreet", but she kept her mouth tightly shut when asked about the title of her seventh book. Her long-awaited appearance at the festival was a far cry from the first time she turned up to the event in 1997, when, billed as Joanne Rowling, she read to just 30 people in a teepee. Since that time, she has given readings for each of the first four Potter books. This year, her appearance coincided roughly with the UK publication of the Order of the Phoenix in paperback. Writing on her official website, she told fans: "I am looking forward to this event very much, because there will be a relatively small audience, which means I can see faces and take questions directly from the fans. "Of course, events such as the readings at the Toronto Skydome and the Albert Hall are incredible, but nothing can replace the pleasure of interacting with enthusiastic readers, as opposed to waving at a sea of skin-coloured blobs." A spokesman for the festival said it was a family-orientated event, with people from as far afield as America, Canada and Holland taking part. He said: "She's an Edinburgh writer and she lives in Edinburgh, so I think it is great to have local writers at the festival." Tickets were issued by means of a ballot, rather than on a first come, first served basis. About 10,000 people turned out on Saturday for the opening of the festival, which is now in its 21st year. The festival - which coincides with the Fringe, international and film festivals being held in the city during August - will feature more than 500 authors appearing in over 650 events during the two-week run. "Fans at today's event... had just one word to describe it all: magical."